I am looking forward to Christmas… Last week I was at the Chicago Rib House Christmas Menu Food Tatsing with fellow bloggers. For this year Chicago Rib House will serve a special of 4-course Christmas Set menu which includes a welcome drink, an appetizer, a soup and a main course and dessert. The menu is available from 20th Dec 2013 to 1st Jan 2014. 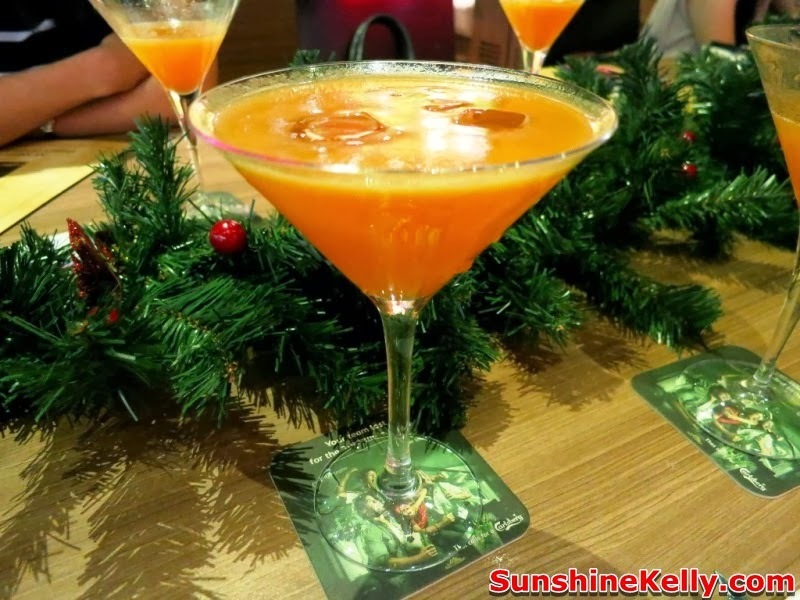 I started off with Peach Bellini, a refreshing drink (peach blended with peach juice and sparkling wine). A little bit of sparkling wine during lunch is just great to calm my day and began a chat. 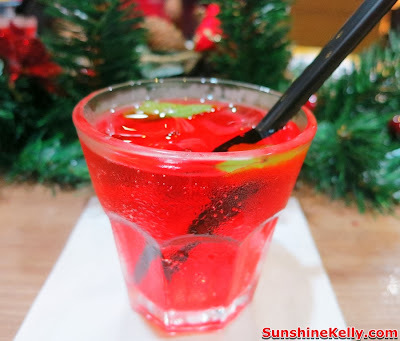 Among the 3 welcome drink this is my preference. 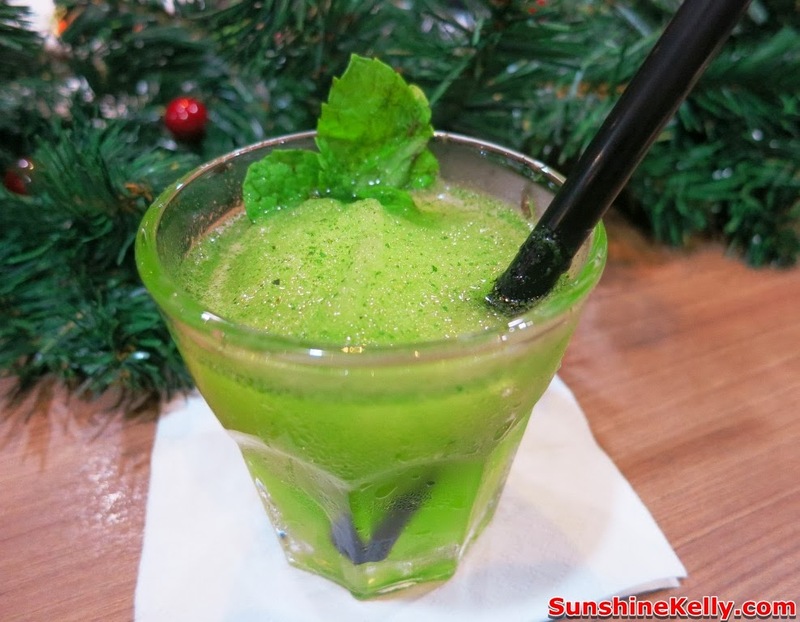 Light minty flavoured and cooling. 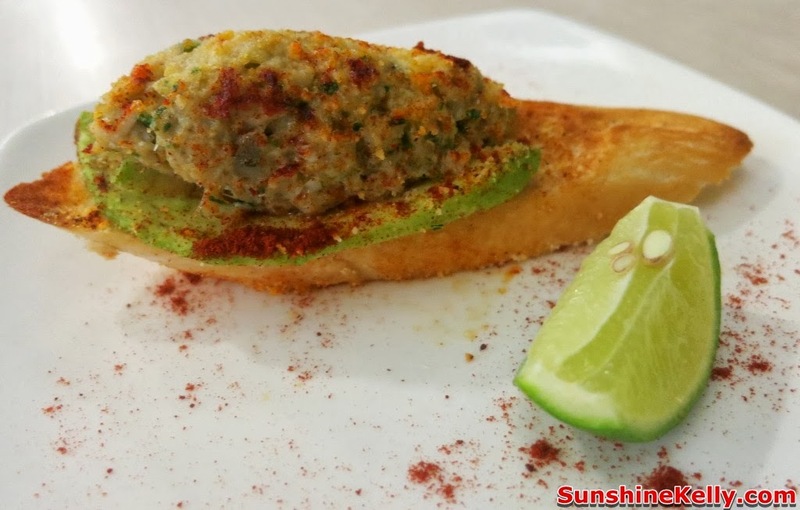 Seafood and creamy avocadp grilled with parmesan cheese on top of crispy toasted baguette. Remember to squeeze the lime on the seafood it gives an overall sweet, sour and creamy taste on a crunchy baggutte. 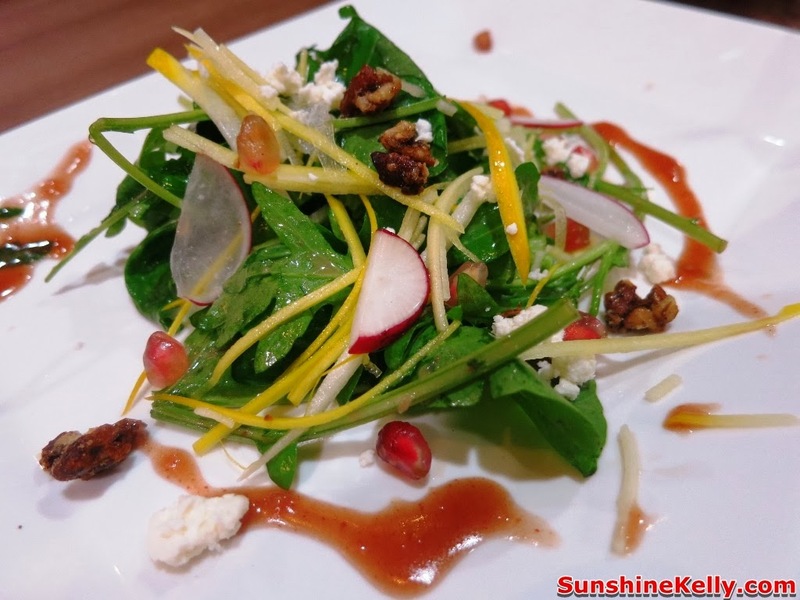 Fresh salad, yellow zucchini toss, feta cheese and honey roasted pecan nuts with tangy sweet pomegranate dressing. Perfect and light combination, I like the pomegranate dressing. This is our sampler set, there are three main course for selection. 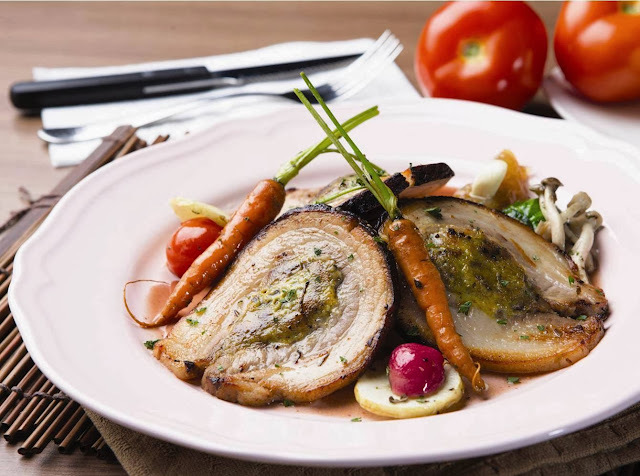 You can choose either Roasted Whole Turkey Leg, Dry Rubbed Coffee Ribs or Roasted Pork Belly Roulade. Among the three main course choices, I would prefer this one. Marinated turkey leg and slow cooked and roasted with thyme. 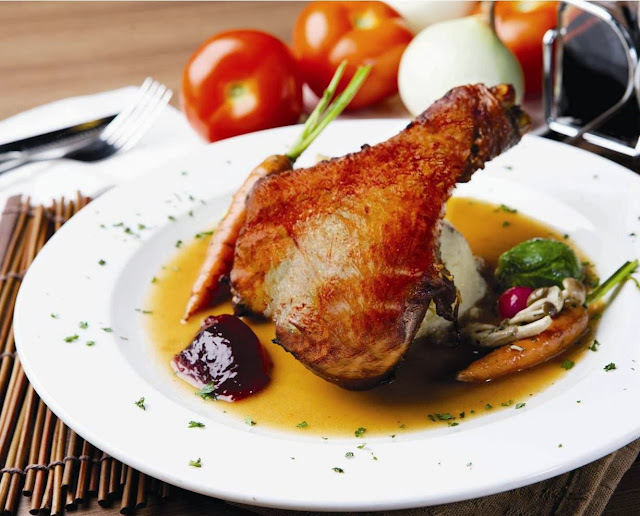 Served with garden variety roasted vegetable and creamy mash potato and accompanied with cranberry jelly and classic brown sauce. 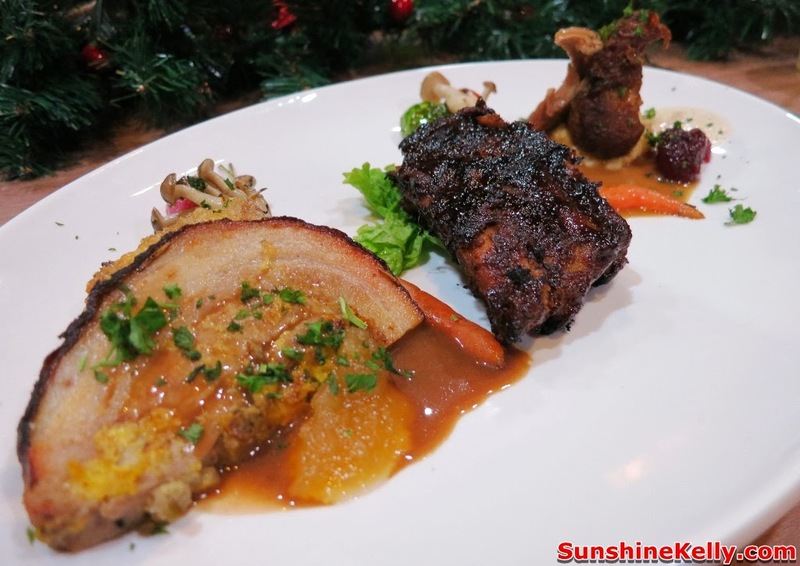 Well, if you can’t wait and wanted to start your Christmas celebration early, this dish is also available at RM29.90 from 6th till 19 Dec 2013. Yummeh! 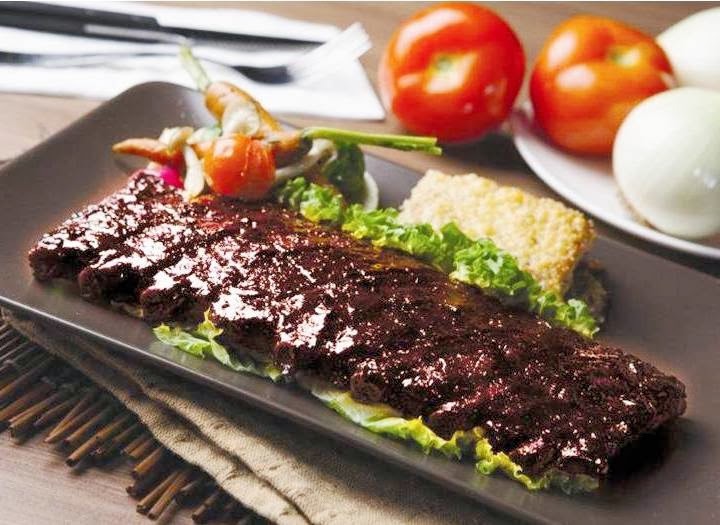 The juicy ribs blanket with coffee sauce. This is oven baked dry spiced baby ribs with chargrilled glazed Coffee Sauce. Also served with garden variety roasted vegetables and potato tartan. Yuhuuu… this dish I skip I need to control my calories. I did take a few bite was soft and flavourfull. However for those who loves pork belly then you can go for this roasted pork belly rolled with sage infused apples, olives and chestnuts. Served with garden variety roasted vegetables, potato tartan, tangy sweet apple compote and red wine reduction. 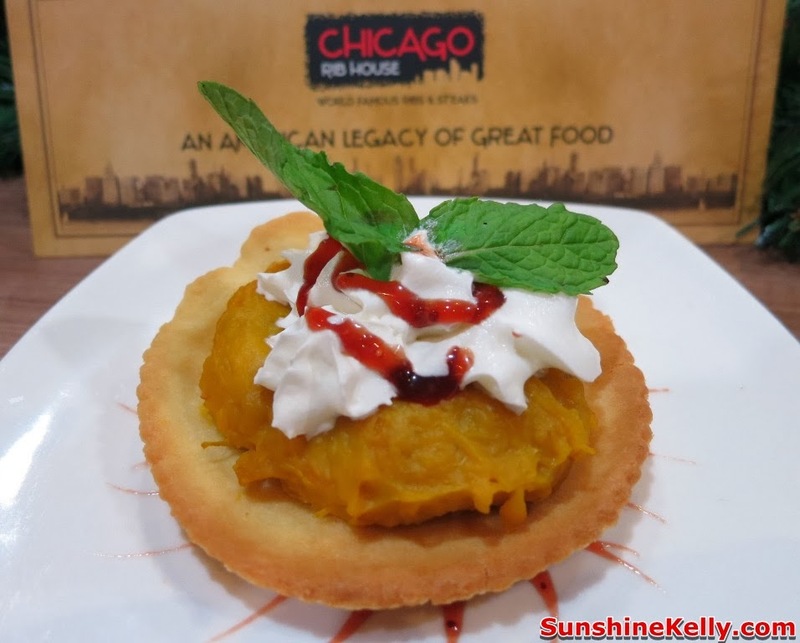 My favourite pumpkin tart, roasted sweet and soft pumpkin filling served with strawberry coulis topped with whipped cream and mint leaves. I am delighted! Oh Yes! there is also Turkey Takeaway if you would enjoyed celebrating Yuletide at home. 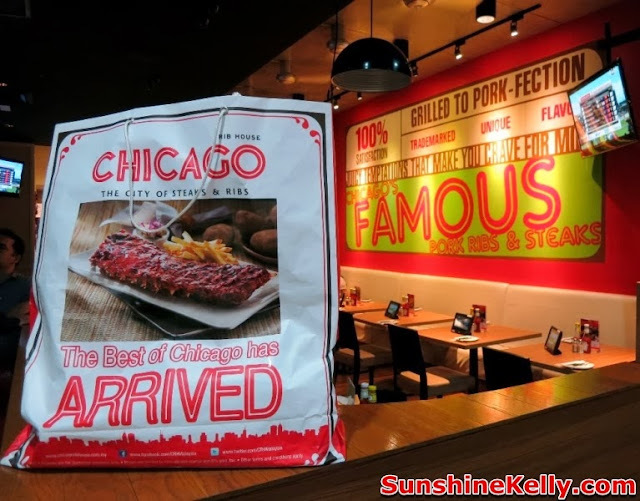 The Chicago Rib House Turkey Takeaway is priced at RM288nett and available for reservation from 2nd till 17th Dec only. Pick up available on 24th and 25th Dec 2013 (Klang Valley) and 24th Dec (Penang) only.